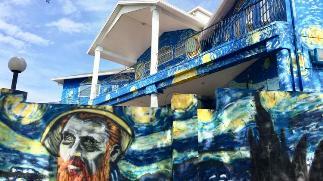 The “Starry Night” home in Central Florida’s Mount Dora has drawn the ire of city officials there for its Vincent van Gogh-inspired murals across the residence and a wall in front of it. Mount Dora officials say the “Starry Night” home of Nancy Nemhauser and Lubomir Jastrzebski violates city code, but attorneys for Nemhauser and Jastrzebski recently received a temporary injunction from a federal judge to stop $100-a-day fines by the city, saying their First Amendment and due process rights are being violated. The dispute was featured on NBC’s “Today” show on Tuesday morning, drawing national attention to standoff in the Lake County. The Orlando Sentinel has been covering the saga of Mount Dora’s “Starry Night” home since 2017. Here are some highlights: In September 2017, a magistrate said that a rendition of Vincent van Gogh’s world-famous “Starry Night” painted on the resident’s wall and house wasn’t graffiti — but still must go. “That means paint it in a solid color, no graphics, no design, nothing that is going to end up attracting attention of the public,” said Magistrate David Tegeler, who ruled it wasn’t a permitted sign under city code. A code-enforcement officer originally said it was graffiti. Nemhauser was told Friday to cover the iconic painting in the city known for its artsy charm. Her property is just outside a downtown full of boutique businesses. She was given 30 days to comply or face fines of up to $250 a day. Her attorney, James Homich, said it was “probable” they would appeal the decision in Circuit Court. A cause célèbre for art versus government, the mural of Vincent Van Gogh's "Starry Night" on a home and outside wall has sparked controversy in Mount Dora, where it was cited as being against city code. In December 2017, an attorney representing Mount Dora asked Magistrate David Tegeler for the maximum fine for violation of city code, $250 a day, but Tegeler reduced it to $100 a day. He found Nemhauser and Jastrzebski not in compliance for 31 days, fining them a total $3,100. His earlier ruling required them to paint the house “a solid color, no graphics, no design, nothing that is going to end up attracting attention of the public.” Read that story here. In February 2018, federal judge has halted the daily-accruing fines levied by Mount Dora — now totaling more than $10,000 — against homeowners accused of violating city code by having Vincent van Gogh’s “Starry Night” painted on the walls of their home.